Please note that you CANNOT upgrade your XP installation to Windows 7. Win 7 will make you blow the install/drive and start from scratch, or install to an empty partition. That being the case, the process for this is a bit more straight forward. 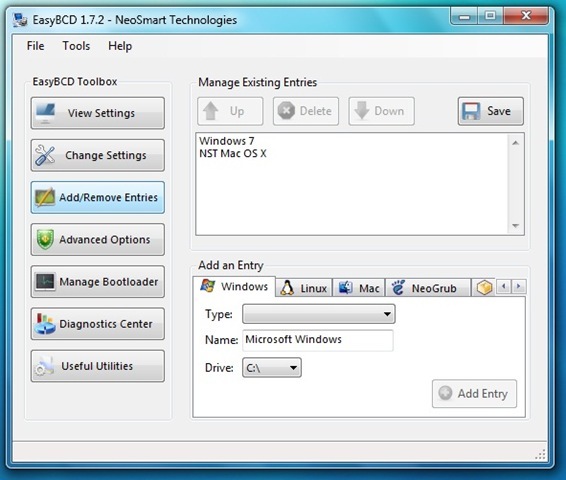 You will need most of the tools and apps from my previous article, and you’ll need one new tool: EasyBCD. As I said, this process is pretty easy, and straight forward. You should also note that I got the inspiration for this post from a thread at Forums.MSIWind.net. Boot from the Wind compatible OSX USB stick or DVD that you created to install OSX and partition the drive with Disk Utility. Insure that the Windows partition is first, and is formatted as FAT32. After that, if you want to have a data partition or simply use the rest of the drive for OSX, that’s up to; but that should be formatted as FAT32 as well so both Windows 7 and OSX can read and write files to and from it. The OSX drive should, again, be formatted as HSF+ (Journaled). The point is that you can partition the drive any way you want, as long as the drive is partitioned with MBR and the FAT32 Win7 partition is at the top of the drive map. When the drive is partitioned the way you want, quit Disk Utility and install OSX. When that’s done, boot into OSX to insure that everything is good to go. I’m not certain if there are still beta licenses of Windows 7 available. If there are, you’ll need to get one, to obviously install Windows 7. If you have access to another legal copy, you should get it that way. When you get to the point where Windows 7 wants you to pick a drive to install Windows 7 to, the install routine will tell you that you can’t install Win7 to any of the drives you’ve got. Pick the intended drive for Win7 and reformat it as NTFS. You’ll then be able to move forward with the install. Make sure that you run Windows Update twice. The first time, you’ll download drivers for the 802.11b/g/n, as well as updates for Windows Defender and a Win7 Beta Client update. The second time, you’ll download drivers for the wired LAN card and the USB Card Reader. Restart the PC as necessary. The computer will boot into Win 7. Please note that you will NOT see OSX at this point. Don’t worry. The install is still there. Now, off the main menu, select repair (first choice). Once you’re done, reboot. 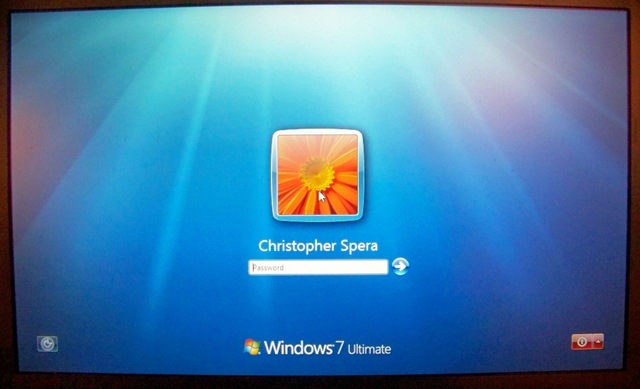 You’ll be taken back into Windows 7 again. EasyBCD is a bootloader, like the Darwin Bootloader that comes with the Wind compatible OSX install. 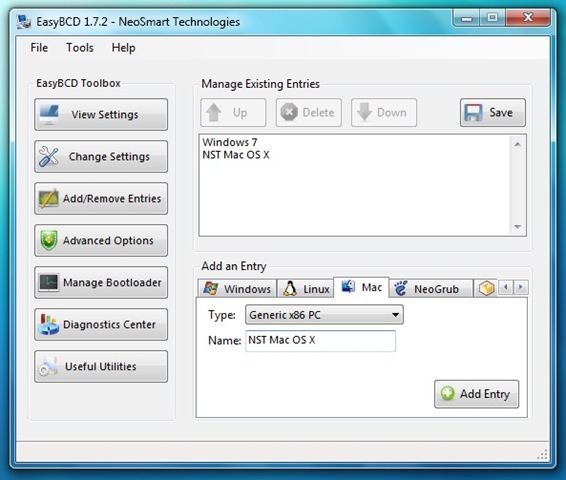 However, unlike GRUB, Darwin, or even the bootloader that comes with Windows 7, its got a GUI interface; and its very easy to use. In the Add an Entry area, click the Mac tab. When you restart the computer, you will see a boot loader screen. Hit the down arrow to choose the OSX entry you just created. Hit the enter key. You’re going to be taken to the Darwin Bootloader. Hit any key to stop the counter, and scroll to the OSX install, and the computer should boot to OSX. That’s it… The only problem that I have found (if its actually a problem) is that there are two boot loaders on the Wind right now. However, I can boot to either OS at my leisure. I’ve already updated OSX to 10.5.6 and reinstalled the KVM drivers. The whole process was done in under 2 hours, and that included installs of both operating systems and updates to both.